We elected to have Chazot voicing his opinion as an original way to approach a complex subject. The equestrian world lacks a sense of humor: Chazot has plenty of humor, as you will see. Yesterday I went outside of the property and I lost my mind. It was captured on video and published online. While a large majority of viewers understood my reaction, the ones that James Rooney refers to as the waspish ghosts of teleological thinking strongly felt that I should have been punished. I was at the edge of panic and the main reason why I did not lose my mind was that Jean Luc stayed with me all along. He was not thinking right or wrong and I am glad that he was not; I was in a state of mind where I could not have distinguished right from wrong. I was under mixed and powerful emotions. We have many times walked and trotted around the property. We have explored the track, which passes behind the farm. This was different; we went by the gate. It was, for me, like entering a new world. In my memory, new worlds are racetracks. There are the starting gates and the tremendous stresses of the rush out of the starting gate. Biokinematic studies have exposed the tremendous strains induced on our legs during the initial 400 yards of the race. The sudden acceleration is not executed at the canter. 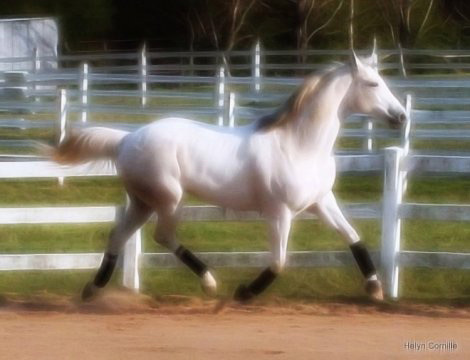 Limb movements are between leaping gaits and canter. Besides the fatigue at the end of the race, the initial four hundred yards at the beginning of the race are the most stressful moments. Our limbs are submitted to enormous strains. If you remember the great stallion Barbaro, he suffered a life-ending stress fracture during the rush out of the starting gate. I have very strong memories from these rushes. I was already very tall and I was disturbed by my own growing process. I did not have great coordination and was totally panicked by the whole event. I zigzagged out of my starting gate not knowing really how to control my legs. The trainer decided that I was not competitive and ordered the jockey to whip me out of the starting gait. This is exactly the type of thinking, that the disciplinarians who suggested that I should have been punished for my behavior, are only capable of. Instead, Jean Luc calmly asked me to focus on the work in hand. His reaction allowed me to stay on the rational side of the edge. The in-hand work was for me the comfort zone. We have long practiced walking side-by-side and this type of work is associated in my mind with ease, kindness and, I can say freedom, since I feel that I am taking the initiative. When I realized that we were going toward the gate, I was at first all exited but as soon as we were out, wariness and perhaps memories raised the tension to a very high level. Deep down I knew that it was not a racetrack but I was out of my current routine. There was a woman holding a large dog. There is a large dog at the farm too but I did not know this one. I was all excited to be outside and my response to excitement is explosion, on two or four legs. The more excited I am, the higher I blow up. I am glad that he introduced me to the outside world in hand because I am comfortable with him walking by my side. It was easier to deal with all the exhilarations. I noticed that he also had the lunge line in his hand. He started me in-hand holding the lunge line in his left hand. I think that he knows that he is too short for me. When I am up in the clouds, he lets go of the reins but still has contact with me through the lunge line. At one moment we went in a small wood and I cooled down because this was almost familiar. This looked like the track behind the farm. The only new thing was the bridge. It was a small wooden bridge and he asked me to walk over it. I did not even think about the bridge and he patted me. I guess in his mind I should have been afraid of the bridge. He should know better; he is a man too. There is no logic in our logic. Then I heard Manchester who was screaming out his lungs. I realized that he was far away and my blood pressure went up. We were turning back and this time I was worried about the bridge. Human decisions are partially created in the cerebral cortex. The other part of human decisions is directed by emotions. For us horses, emotions have an even greater role in our decision-making. I will never understand why humans have such a hard time figuring why we spook at one thing one day and not the next day. The reason is quite simple our emotions exacerbate our perception. On the way up, my emotions were cooling down and the bridge was not impressive. On the way back, my emotions were mounting and the bridge looked more impressive. This is, from my point of view, perfectly logical. Then Manchester whinnied again and my mind returned to the edge of panic. I was all excited to be out but I was also worried. The surroundings were unfamiliar. There was this woman with a dog larger than me and I can feel Manchester’s wariness in the tone of his voice. All this was more than I could take at once and I reared. As I was up in the air I realized that I overachieved. I was now in trouble. I saved the situation and my balance by propelling myself into a small jump forward on my rear legs. As I was landing he was thinking, nice move. At the Spanish Riding School they need years to teach that. Sometime he really annoys me. I am all into my excitement and he does not enter the spiraling. In fact the next stride he was asking me to keep walking just like nothing special at all had happened. I tried to walk with him but I was still too excited. I did walk with him but had to add a few more jumps. We went back home and Manchester cooled down. He did not whiny when he saw me because he is a true friend.